MDM – Not all are created equal! HomeBacon and the art of living. Bacon and the art of living. “Bacon, that magical delicacy! Cured pork meat, mostly smoked, with a reddish, pinkish colour and a distinct taste.” I have always loved it. The Dutch East Indian Company (VOC) established a trading station at the Cape of Good Hope to supply water, fresh vegetables and meat to passing ships on their long voyage between the East and Europe (Heinrich 2010: 10). Since this time bacon has been a prized commodity at the tip of the great African continent (Heinrich 2010: 32). Imported bacon has since those days been better than local, heavily salted pork. As the local bacon from Van Riebeek’s day (Heinrich 2010: 32), the Combrink bacon had to be soaked in water for 16 days before it could be eaten. My dad was a local magistrate. Together we would undertake a weekly trip to the Combrinck & Co butchery in Woodstock to buy bacon. According to him Combrinck was taught how to make bacon by Othmar Scheitlin who started the butchery. He knew and liked Scheitlin a great deal. Scheitlin was born in Switzerland. When he turned 18, he left home. He traveled through France, Holland, England and Germany, got a job as a cabin-boy and worked his way to the Cape of Good Hope. Here he set up the pork butchers shop in Woodstock where Jacobus Combrinck was a foreman and later took the business over when Sceitlin returned to Switzerland with his family (Linder 1997: 270; Simons 2000: 7). My dad would make the hour long journey from our home to Papendorp, as Woodstock was known in those days, once a week to buy quality pork and this would always include bacon! He would always tell me that the only thing Scheitlin and Combrinck could not do well was curing bacon! I was 6 years old when Combrinck & Co moved to an area in Cape Town called the Shamble. To shop number 4. The move happened in the 1860’s. The quality of the bacon did not improve and the stench of the Shamble where the cities animals were slaughtered, would make me intensely dislike the weekly trips with my dad. They would slaughter the animals and bury the offal on the beach so that the tide would carry it away. At night, one could hear what sounded like hundreds of homeless dogs fighting over scraps of food on the beach. By day there was the unbearable stench and the flies. Millions of flies. (Simons 2000: 13, 14). My great grandfather on my fathers side fled to Holland from Denmark after the civil war between the Protestants and the Catholic’s. In Holland he was trained as a miller and limiting opportunities in Holland motivated a petition to the VOC to be sent to the new colony as a baker. On my mom’s side, my great grandfather came to the Cape as a soldier of fortune, trained in Waldeck, Germany, hired out to the VOC by the prince of Waldeck and sent to the Cape to protect it from the locals and enemy nations. The family on my mom’s side were at this time living in the Orange Free State and the Zuid-Afrikaansche Republiek, the ZAR. The scene was set for the adventure of a lifetime. Oscar Klynveld was farming with milies, cattle and pigs. His farm was in the old Boer republic of the ZAR, in the Potchefstroom district. I knew him from visiting friends in the Fredefort district, close to Parys. We became friends when I helped him one year to get his chickens to the different kooperasie stores in the district in time for Christmas when his ossewa fell into a ditch during a terrible storm. We distributed his chickens and bread flower and became friends for life. I have always been irritated by the thought that the bacon produced in the Cape was of such inferior quality. Bacon was still being imported from the Britain and Holland to the Cape and sold to the locals as well as to passing ships who were prepared to pay high prices for it. War and roomers of war were again in the air by the late 1800’s. I was 26. The Anglo Boer War of 1881 made me realise that Britain wanted to control the trade route to India at all costs. They also wanted to control the recently discovered Diamonds from Kimberly and the gold from the Transvaal. They would never relinquish them! Unlike most of my countrymen, I did not see any possibility for victory against the might of the British Empire. Instead, the thought started to develop that we must think past the war and strengthen ourselves economically. No matter who’s flag was flying in the Cape! “God only help those who help themselves!” was another one of my dad’s many sayings. This was the point that Oscar and myself have been discussing at his farm when I told him about the bacon and he told me about his pigs. How one sow produced many piglets compared to cows and sheep who had few babies in a year. A picture started to form in our minds. We made the decision that we would make and sell quality bacon. Nothing else would do. Sold across our land and to passing ships, the best bacon on earth! When it seemed imminent that war would break out sooner rather than later, we started to market our plan to carefully selected friends and family. We needed support for the venture. A meeting was held in Oscar’s voorkamer on the farm. It was a bitterly cold night. A hand full of burgers came. Oscar’s wife, Trudie, expecting their 3rd daughter was there. My Ava was there. James and Willem, Oscars two brothers came and Anton his father-in-law. Oscars dad was a minister in the Dutch Reformed Church. He opened the meeting with scripture reading and prayer and said a few words. We decided that since my kids were in primary school already in Cape Town, I have to go. Travel to Europe and Britain and learn the art of curing bacon! Oscar would stay behind, muster the support and prepare for our factory in Cape Town. We decided not to go to England straight away. On the one hand there was the fear that war could break out any day and this would jeopardize our quest. On the other hand, since my ancestors came to the Cape of Good Hope from Denmark and since an old spice trader advised us to visit Copenhagen first, the decision was made to start there. The next thing I knew, cold Free State wind was in my face and I raced back to the Cape through Bloemfontein. I spend a last week-end with my Ava and the kids. We hiked up our beloved Table Mountain. It was the mountain that brought us together. As kids we would spend hours and days exploring its majestic cliffs. As teenagers we both acted as guides, taking European and American visitors to the top. We climbed one of our favourite routes. At the top we sat for a long time, looking down on a growing city. A small mountain stream ran all the way from a crack in the mountain where a gorge has been formed by geological activity that non of us understood, through the city basin, past the VOC castle and into the sea. I wished the moment would last forever! Before I knew it I was off to a waiting steam ship in the Cape Town harbour and the adventure of a lifetime! 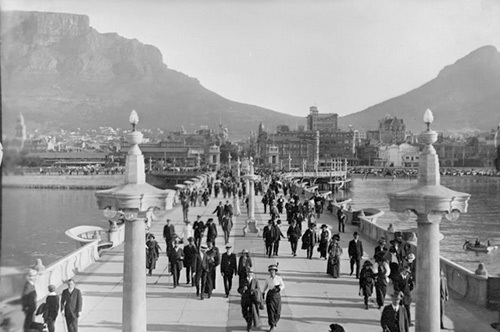 What follows is the collection of letters I sent to friends and family from Europe and later, from the Cape Colony. We set out to discover the art of curing bacon. In the process we all changed. During the quest, we not only had to learn the art of curing meat, we came face to face with ourselves and who we are. Our deepest fears and hopes. We learned about love, family, great friendship, trust, comradery, courage and following an unlikely dream. These letters tell both the story of bacon and the art of living. (1) Heinrich, Adam R. 2010. A zooarcheaelogical investigation into the meat industry established at the Cape of Good Hope by the Dutch East Indian Company in the seventeenth and eighteenth centuries, The State University of New Jersey.